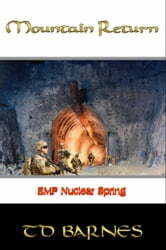 EMP - Nuclear Spring is Book 2 of the EMP series realistically depicting life post World War III. Four years have passed since the EMP attack and the nuclear bombs that followed. For the first time, the survivors are able to come out of the Yucca Mountain underground complex initially constructed to store nuclear waste. They find themselves under the surveillance of Islamic activists of the Islamic Brotherhood who survived in Central America. The Brotherhood is moving into Nevada to take control of the Hoover Dam, which gives the Brotherhood control of the Colorado River and the electricity it generates for the western United States. Both the Brotherhood and the survivors in the mountain realize the jet stream is returning the fallout of the nuclear winter back to the region. Both must secure food and supplies to carry them through the return of the fallout. The survivors in the mountain repel attacks on the mountain by the Brotherhood and enter the next phase of nuclear winter prepared to battle the Islamic Brotherhood and drive them from the region. The mountain survivors establish a meteorology station capable of monitoring the weather fronts still carrying fallout from the bombs. The fickle weather controls their stay outside the mountain. Colonel Bradley realizes the need for intelligence on what awaits them outside the mountain. He forms a nerd squad to seek surviving weather satellites and satellites still active in other parts of the world. He and some of the others suspect one of the Homeland Securities of being an Islamic mole. Their suspicions are proven true when the mole detonates a bomb inside the mountain that takes many lives. The mountain uses a secret weapon from Area 51 to protect the mountain.